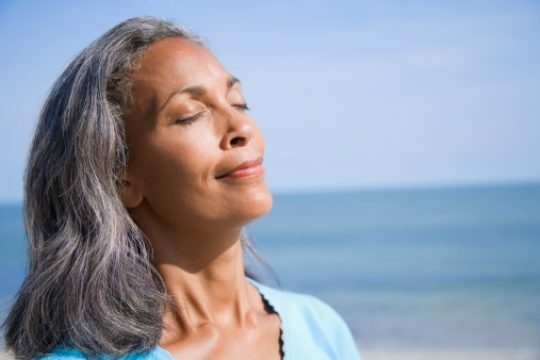 Healing ways to boost your mood may be simpler than you think. You can learn to make yourself feel good. And often when your mind feels good, so does your physical body. For today’s multi-tasking women, that’s good news! Dr. Abe Wolf, a psychologist and psychotherapist, shares his top healthy living tips that will help both your mind and body feel better, helping to boost your mood and lead a healthy lifestyle. No question about it. Exercise is the best way to lighten your mood and get more energy. Cardiovascular exercise, weight training and yoga are all good ways to boost mood. 30 minutes on most days of the week is all you really need! Not enough exposure to sunlight can lead to depression. Try to find time each day to be out in the sun, and, remember your sunscreen. Eat small, frequent meals throughout the day and include grains, vegetables and fruits. These are simple ways to make healthy choices. Choose lean protein to help you stay satisfied longer. 4. Get the sleep you need! Getting enough sleep will greatly enhance your mood and enable you to feel your best. Try to get at least 7 hours a night. Always try to find positive ways to express your feelings. By talking to a family member or friend, your physician, or writing in a personal journal, you can share your good news, as well as resolve negative emotions. Smile! Often how we choose to look at things can determine how we feel. Choose to maintain a positive attitude. Try to always look at the glass half-full, instead of half-empty. Remember, laughter is the best medicine. Make sure you are on your list of priorities. Take time each day to care for your body by getting to the gym, eating healthy, or even going to the spa. Any pampering will make you feel good. Volunteering, making a donation to your favorite charity, or writing someone an encouraging note are ways many women like to help others. It seems like helping someone else always makes you feel better. So if you’re feeling blue or unhappy, try out these tips to feel better. These tips will teach you how to boost your mood, both mentally and physically, in a healthy way. If these tips or other things you try don’t seem to change how you are feeling, talk to your physician for additional help. Having a strong relationship with your physician will enable you to get the resources you may need.